I know it's November and October is already a distant memory, but there were FIVE Wednesdays in October...the last one being Halloween...and thus a few straggling comics left. Were the comics released on Halloween day extra spooky? No, not at all. They were pretty cool though! Let's take a look! 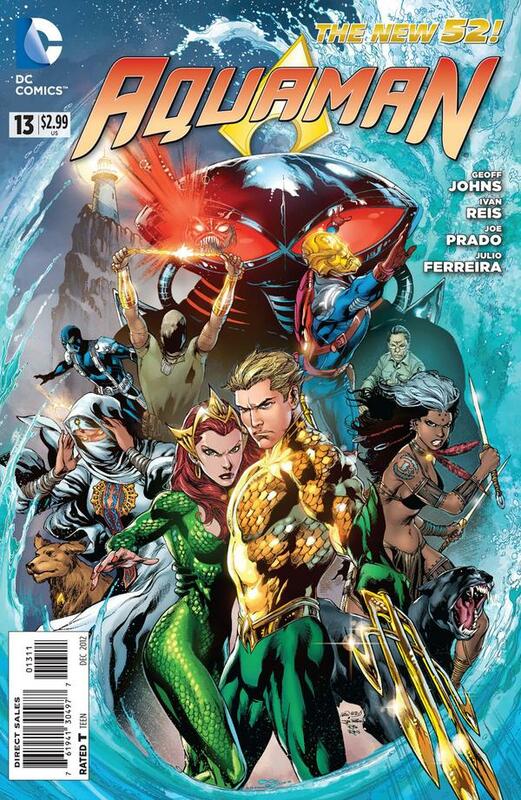 Aquaman #13 - "Please just GO! Manta gutted Kahina and blew Vostok's spine apart. I don't want you to watch what I do to him." The endgame of the Others story-line that has been playing out for months now is finally upon us, as Aquaman must track and locate Black Manta, who has managed to collect a few of the Atlantian artifacts that Arthur's teammates once carried and also find the lost Sceptre of Atlantis, a weapon so powerful it was hidden from even Arthur's knowledge and is rumoured to be the device that originally sank Atlantis into the sea! Unfortunately, one of the other artifacts that Manta stole allows him to instantly teleport anywhere in the world. Makes him a hard guy to chase! Arthur is pretty determined, though. He's lost his father. He's lost friends. He wants payback, and that means he wants Black Mantas blood! BUT...he may lose a lot more before he can get it. How do you stop a guy who holds the power to sink continents in his hand? Of course not all of our adventures occur under the sea! Join me after the JUMP for Action Comics and Batgirl ANNUALS! 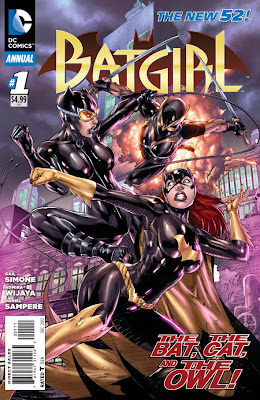 Batgirl Annual #1 - "From the first moment I saw Batgirl...I didn't like her at all." Anyway, of course the Court is responsible for the arson (trying to frame Bruce Wayne no less!) 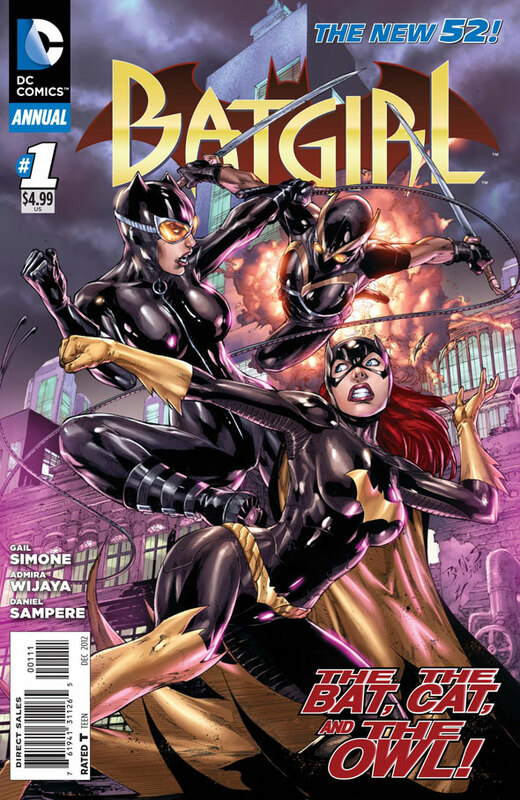 and the two plots converge, forcing Catwoman, the Talon and Batgirl to confront not only each other but also at least ONE member of the Court of Owls. Each must choose what side she comes down on, leading to some interesting and potentially far-reaching results! Action Comics Annual #1 - "Maybe that's the mark of a superhero: Not just incredible powers or saving the day, but the effect you have on other people. Inspiring them to keep trying..."
Both Lex Luthor and Dr. John Henry Irons (aka Steel) return to the pages of Action Comics for the first Annual this week! Each have a part to play when the Man of Steel is forced to battle for his life against the Kryptonite Man! K-Man, also known as Ramsay, actually appeared a while back in Action Comics when Superman stopped him from beating up his wife by throwing him out of a second story window into a river, breaking both of his legs in the process. Considering the dude had been apparently beating his wife for YEARS, Supes felt justified...Ramsay, of course, sees things differently, and now wants both revenge AND his wife back! With the power of Kryptonite at his command, he may just accomplish his goals! Perhaps even more threatening that the Kryptonite Man is the fact that Lex Luthor learned something today. In his own words, "we now know that K-Radiation can hurt, or perhaps even kill Superman...which raises some fascinating possibilities..."
And that's it! Only 3 titles last week, but not to worry...tomorrow is another New Comic Book day!! 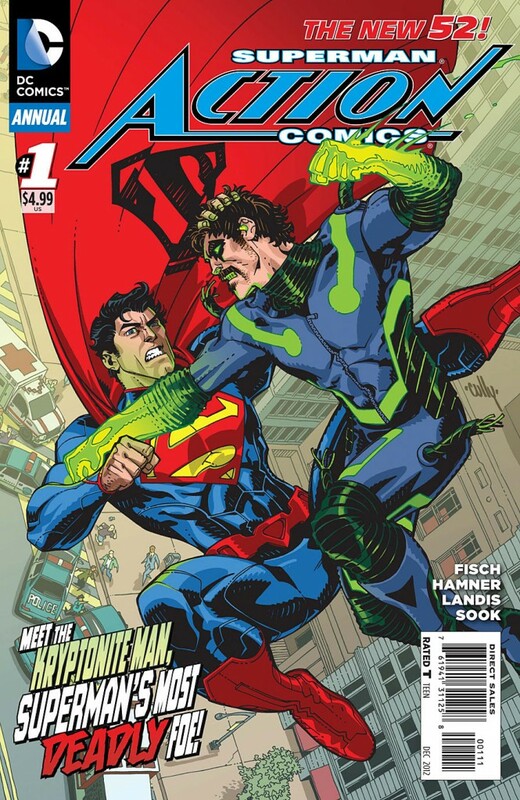 We'll get more Action Comics, some Detective Comics, Green Lantern, Green Arrow and more! Stay Tuned! Oh and if you haven't had enough of Halloween or evil clowns, watch as I "kill" my friend Doris in Cuddleblood's Halloween! I think it's pretty tame, but my mom hated it! Have a great week everybody! Don't forget to vote or celebrate Guy Fawkes day or I dunno, set your clocks back? Do what ya gotta do. Peace!